I had the great fortune of receiving a copy of Stray by Rachel Vincent before its official release date. After tearing open the envelope the night the book came in, I settled in to read a couple chapters before bed. I turned the last page of the book about the time my alarm went off the next morning. I was so riveted by the story, I didn't even notice the entire night fly by! So I've been reading The Taste of Night by Vicki Pettersson (the second book in her Zodiac series, which I highly recommend) and near the front of the book is a quirky little scene involving the main character's friends and a pencil. Without giving anything away, the friends are slightly air-headed socialites, and the main character, Joanna, walks in to find them standing naked in front of a mirror performing what they call the 'pencil test'. Circumstances being what they are, Joanna has to pretend she knows what they are talking about, and to be honest, at the start of the scene, I was just as lost as her. So what is the pencil test? I was having a conversation with my hubbie the other day when it ended abruptly with the comment that I didn't live in the real world. Now there are lots of reasons someone could look at me and say I didn't live in the real world. The most obvious reason might be the fact I write fantasy so I spend a lot of time thinking about things and people who don't exist. Or maybe the fact I don't work a regular nine to five in an office, but spend ungodly amounts of time in the spare bedroom I've converted into a office/studio unless I have to run out and see a client face-to-face. Being able to go to work in my PJ's tends to earn some people's scorn. But neither of these reasons is why my hubbie accused me of not living in the real world. Because I think paying $100 for a pair of shoes is absolutely preposterous. 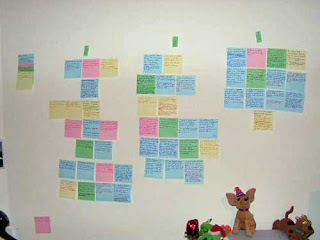 Several months ago Rachel Vincent posted a fun way of plotting using a dry erase board and post-it notes. I kept meaning to try it, but never got around to it until today. Is accomplished related to exhausted? I (mostly) finished two really huge projects today that I had on the back-burner for a little too long, so I am feeling very accomplished at the moment but I also have that foggy feeling behind my eyes like I'm teetering on the edge of burn out. I suppose that happens when you devote seventeen or so hours a day, several days in a row, to the same task. It is nice to feel like I really got something done though...I'd been going through a bit of a monotonous dry spell for a couple days.